Those crafty girls at Redbook had to tease me today with a tweet promoting this recipe. How could I resist passing it along to you guys! Key Lime Cake? I’m so intrigued!!! My son is a Key Lime addict. I’m going to make this soon!!! I have made this recipe and gotten rave reviews from everybody who tried it. 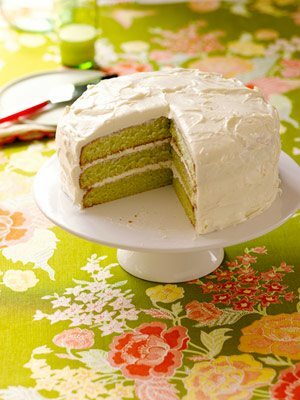 It is so moist and such a unique flavor instead of just an overwhelming sweet cake. Can i bake in 1 pan & cut it to 3 layers?? I wanted top print this recipe as my computer is not close to the kitchen. That way I would not be running back and forth plus I could do the grocery list from the recipe. I had to print 14 pages to get one recipe!